Dr Seuss Day is coming and I couldn't be more excited! Mom grew up reading Dr Seuss books and I just happen to think he's such a wise man and he's also lots of fun! 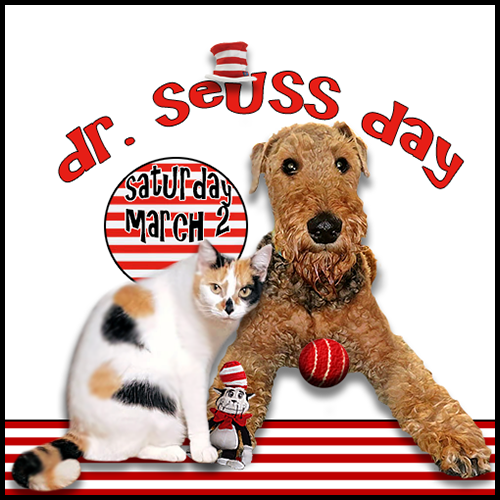 Chimera and I will be hosting Dr Seuss Day on Saturday, March 2nd. I was so honored to be asked to be one of the hosts! It's one of my favorite days of the year! You're going to join in, right?! That sounds like wonderful fun for lots of some ones. I would love to join in. Hop on Pop and Green Eggs and ham were a 'staple' LOL in this house in the 1970's! Love seeing the dynamic M&M too. We will try to get our mom to help us participate. She read those books as a kid too. We will put that on our calendar -- and try to remember to look at the calendar. Oh boy, sounds like fun! What do I have to do? Looks like you're ready for the day - cute, cute, cute! 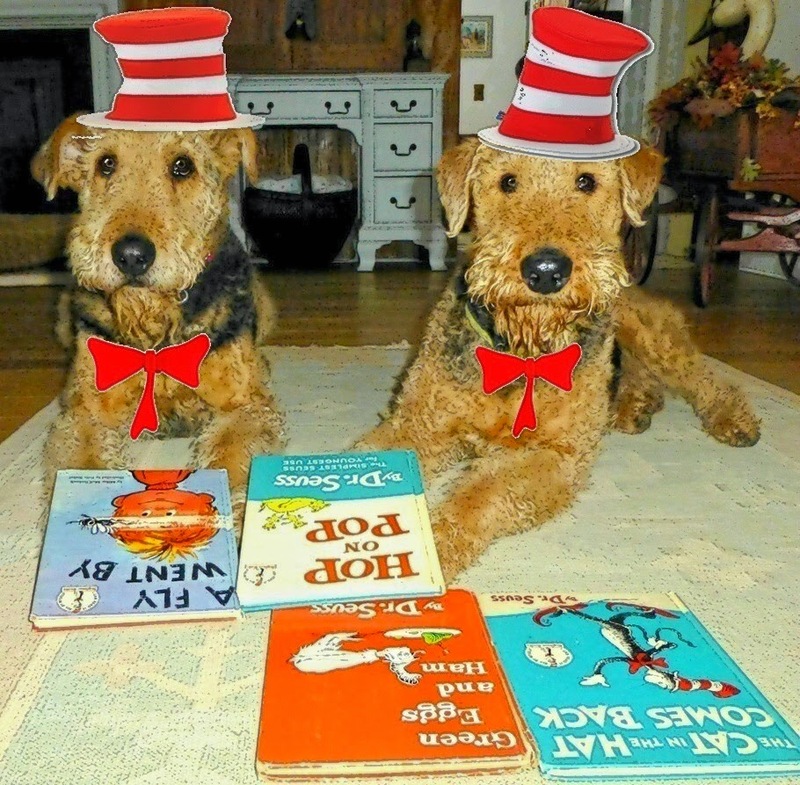 We are just so excited about Dr. Seuss Day March 2nd. We still have our books from when we were children. Lovely photo of you and Angel Mitch. We love the hats. Thanks for the share. Have a wonderful day. We hope to get our act together to be in it. This sounds like fun. My literacy student loves Dr. Seuss. 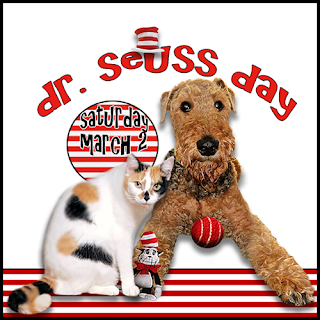 We love Dr Seuss Day, but it is a Saturday and we are traveling that weekend, so I don't know yet if we will join. What fun!! We love the old photo of you and Mitch! We hope to be there too!!! We hope our lady doesn't forget or it will be a bad day yet! Yay!!!! I love that photo of Molly and Mitch! Also make sure we have jots of Juice!!!! Not a vey good interpretation of the great Dr Seuss but it is Thursday!!! we will put it in our Diaries. Hi hi hi! Ojo here! I love one fish two fish red fish blue fish. Because - FISH! Yum. We don't post on the weekends but might make an exception for the good Dr. Seuss. We love him too! We can't wait until Dr. Seuss Day!!!! 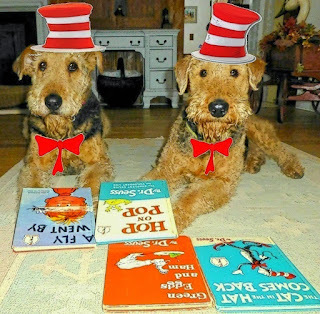 We love Dr Seuss too. We'll join you.